CTS (Cincinnati Thermal Spray, Inc.) and SST (Solution Spray Technologies, LLC) have announced the signing of a non-exclusive license agreement that solidifies a long-term partnership with goals to further commercialize the solution precursor plasma spray process (SPPS). In this partnership, SST will be working directly with CTS engineers to replicate SST’s SPPS coating process at CTS’s Technology Center located in Cincinnati, Ohio. CTS has already placed investments in areas such as specialized liquid feeding equipment and next generation plasma spray process control systems to support the program. Upon the installation of the equipment, CTS and SST will begin executing a full scope R&D program in Cincinnati to further enhance the SPPS process with preliminary targets set to increase process throughput. The two teams are also working closely to identify and introduce these unique coating technologies to a wide variety of new markets. SST personnel have pioneered the solution precursor plasma spray (SPPS) approach wherein a liquid chemical precursor, containing the desired cations, is atomized into the plasma jet. 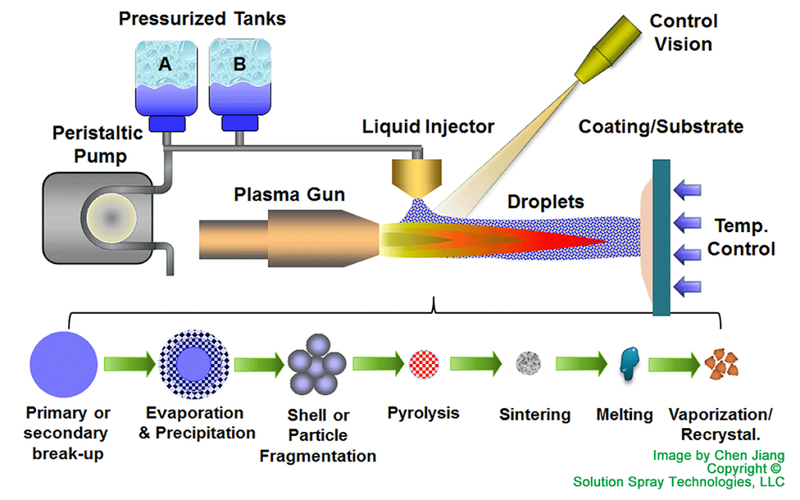 The injected solution evaporates and the resulting salts are pyrolyzed, followed by melting and deposition as micron-sized splats. The SPPS process results in smaller splat sizes of <2 microns compared to 30-100 microns with traditional APS processes using powder, which makes many unique microstructures possible ranging from highly porous to highly dense. For example, the SPPS process can enable the deposition of thin (<50 microns), dense (<5% porosity) coatings, which is very difficult to do with powder-based processes. SST’s SPPS technology offers the potential to process ceramic coatings with unique microstructures and compositions that are difficult or expensive to process with other competing processes. A fast, high-throughput process for SPPS can be a game-changing enabler for the introduction of plasma sprayed ceramic coatings for a wide range of microstructures ranging from thick coatings with controlled vertical cracking suitable for thermal barrier coatings to thin dense coatings suitable for corrosion protection. The SPPS process offers the possibility to deposit value added coatings with commercially available precursor materials with a line-of-sight process at a fraction of the cost of the vapor based processes. It offers the potential of depositing coatings with chemistries that will be very expensive to process through traditional powder based plasma routes. Creation of new compositions directly from soluble chemicals avoids the complication of making sprayable powders and dramatically reduces the cost and time needed to develop new compositions. Further, it allows the processing of a wide range of microstructures such as highly strain tolerant, porous microstructures at one end of the spectrum, or very thin / very dense gas impervious coatings. Both of these microstructures are difficult to process through traditional plasma routes. As an added benefit, unlike traditional plasma routes, the SPPS route allows rapid screening of a wide range of compositions for development projects. Some of the markets already identified as SPPS potential candidates are listed below. The Solution Precursor Plasma Spray process has been under development for over a decade, with substantial funding from the US Department of Energy through the University Turbine Systems Research (UTSR) program and the Small Business Technology Transfer Research (STTR) programs for TBC development. SST also has funding from the National Science Foundation through a Small Business Innovation Research (SBIR) program to develop thin, dense EBCs that are an enabling technology for the next generation of hot section turbine materials, such as ceramic matrix composites. In recent years, SST has been working with a higher temperature SPPS TBC, Yttrium Aluminum Garnet (YAG). SPPS YAG TBCs have the potential to be used at temperatures 200ºC greater than YSZ TBCs, based on increased phase stability, sinter resistance and CMAS resistance. SPPS YAG TBCs also exhibit a 50% reduction in elevated temperature (1,000-1,300ºC) thermal conductivity and increased thermal cyclic durability compared to APS YSZ. The commercialization agreement allows both CTS and SST to bring together years of industry know-how and a shared commitment to excellence. Both companies retain talented people that have been key players in the advancement of thermal spray technologies over the years. SST was formed in 2015 by HiFunda LLC, Dr. Eric Jordan, and Dr. Maury Gell to address the opportunity and need for advanced ceramic coatings in a variety of applications, as well as the need for fast, cost-effective methods for development of such coatings. SST has an exclusive license from the University of Connecticut for the Gell and Jordan SPPS patents. The team has vast experiences to draw from as technology leaders and respected researchers in the field of materials science. 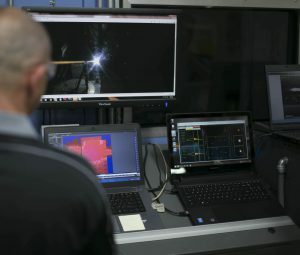 Specifically, from a thermal spray perspective, both Eric and Maury have worked closely with the 5 largest turbine engine OEMs as well as several coating suppliers developing and studying thermal spray applications over the last 30 years at the university of Connecticut. SST’s primary focus at this time is on the commercialization of the SPPS coating process by licensing the technology to engine OEMs and coating service providers. With roots as a thermal spray provider in both the aerospace and power turbine industries, CTS is a company that provides protective coatings to a broad array of industries. Over the last two decades, CTS has successfully expanded the number of markets they serve to include industries such as steel, medical, oil & gas, automotive, electronics, pump, and many others. It’s this broad portfolio that CTS and SST hope to leverage when identifying niche opportunities for the SPPS process. Initially, Kirk and his team at CTS will be investigating ways to improve the throughput and robustness of the SPPS YAG TBC process by studying the effects that various plasma torches and other process parameters have on the SPPS coatings. There will be extensive characterization work carried out, and the team plans to benchmark the SPPS YAG TBC’s against other advanced TBC systems in the industry today. CTS is already discussing SPPS with engine manufacturers, repair entities, and utilities that may be interested in testing the new TBC on actual components. One of the primary skills that CTS brings to the table is its knowledge and ability to carry out full-scale part qualification programs. From tool fixturing to advanced robot programming, CTS has 30 years of experience of ensuring that optimal coatings indeed reside within every unique feature of each part qualified. The need for higher temperature thermal barrier coatings continues to be of great interest to engine designers, as higher combustion temperatures drive improved efficiencies within the gas turbine engine. The newest of fuel-efficient aircraft engines are now prime reliant on thermal barrier coatings (meaning the engines will not operate for long without a TBC coating). This need has driven new advancements in thermal spray materials within the coatings technical community. Much research has been done over the last decade investigating alternatives to the historic Yttria stabilized Zirconia coatings. Focuses on lower conductivity (K) materials have resulted in many new Zirconia based materials doped with rare earth oxides to slow the rate of heat transfer. Reduced thermal conductivity has been achieved, but at the cost of other property attributes of the advanced TBC systems. Many of these newly developed TBC coatings exhibit degradation in properties such as thermal cycling and erosion resistance. 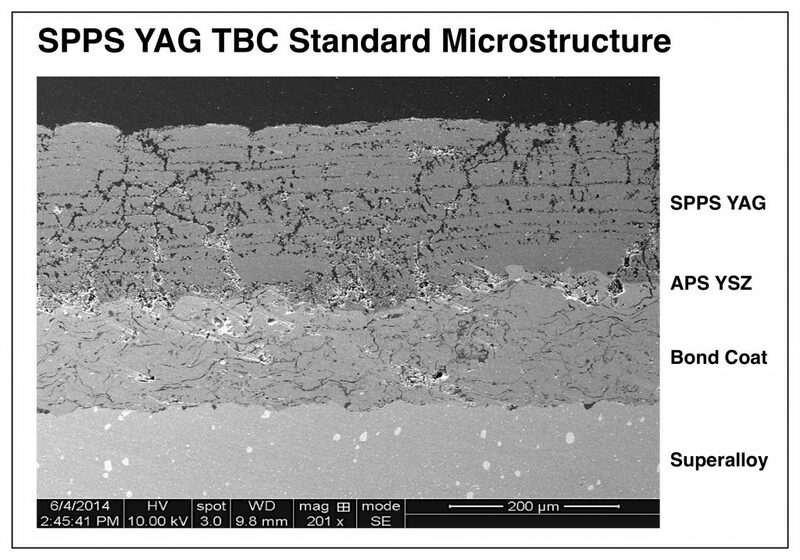 CTS is interested in investigating the SPPS process in this area of study because it potentially provides new methods for unique control over TBC materials, porosity management, and the ability to create in-process microstructure defects that benefit a proper TBC coating system. In certain areas of thermal spray (such as TBC coatings), starting with a liquid precursor offers opportunities to generate improvements in microstructures over those generated by traditional thermal spray methods. CTS and SST will be breaking new ground as they work together to further study and commercialize the SPPS process. Both parties are excited of what the collaboration can bring to the thermal spray community. The teams will be publishing joint papers in the future to disclose SPPS process achievements, and recognize new applications identified for this niche thermal spray process. Kirk Fick at kfick@cts-inc.net, or download our whitepaper to learn more about the thermal spray process.